With the arrival of good weather a lot of us start thinking about bike riding. My partner and I love peddling around, but after we went from one kid directly to three when our twins were born, I found I was out on my bike virtually never, as both of us needed to be available. What to do for the urban mummy on the go with more than two kids? The answer came via friends with three young children and no car: a cargo bike! I had not known these genius contraptions even existed, but apparently they're common in Europe. Essentially, a cargo bike is a bicycle with an extended platform between the handlebars and the front wheel, making room for a cargo bin, flat hauler skid or numerous configurations of people seats. 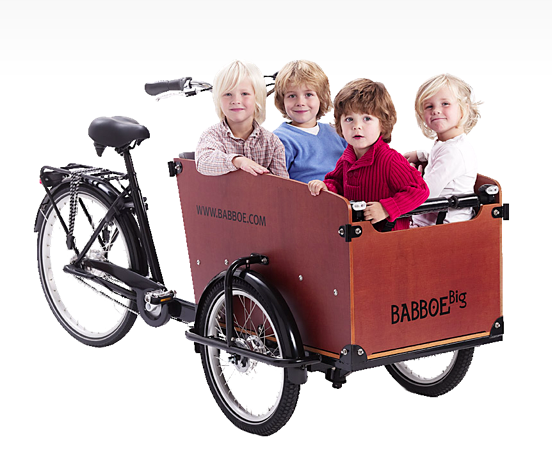 Online, I found styles that accommodate two, three or four kids, sometimes even with additional cargo space! My interest peaked, our friends generously offered to loan it to us for two weeks. With my four kids (then aged one, almost three, almost three, and five) I took several trips with the bike, including to local parks and across town on a day trip. What a blast! The kids loved it, and cars generously shared the road with us (presumably owing to our impressive width). Certainly it handled a little differently than a regular bike, but after taking it slow for a few minutes I caught on quickly. It was easy to get the kids in and out and wonderful that they were in front of me and up at car-window height. One caveat would be regarding steep hills: cargo bikes don't seem to come with a great range of gears and, being heavier, can be a challenge to peddle up a serious incline. And that heavy weight means it's no easier to get off and walk it up. 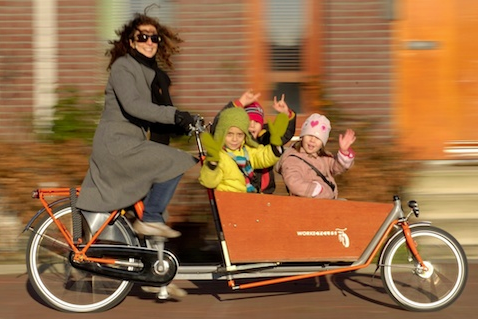 But, unless you live in a super-hilly area, a cargo bike is a great alternative to a car for a multi-kid family. Have you ever tried one? Share your experience with us!